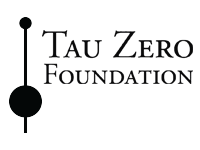 The Tau Zero logo is the beating heart of our brand; it is an icon encompassing our mission and goals. The point at the top symbolizes another habitable world, across interstellar space; the series of dots underneath represent all the steps needed to eventually reach that world. The main focal section is our current situation, with an arrow pointing the way within a coordinate system, the glow of Enlightenment behind. The shining rings represent glowing progress. While existing space organizations take the next obvious steps and entrepreneurial adventures bring the thrill of spaceflight to the people, the Tau Zero Foundation reaches beyond, for advances that will revolutionize spaceflight. This is the realm of pioneers, risk-takers, and breaking with established norms. Occasionally you may see simplified, emblematic renderings of our insignia, such as the images below. We seek to join with you in sharing information and to actually making the technical progress to take humanity to the stars – ad astra incrementis. The Tau Zero Foundation is a 501(c)3 non-profit organization dedicated to pioneering advancements toward interstellar flight. Website designed and built by English Marketing Service.